It is an old matter that Cloud Computing is not a technology but usage of virtualisation as enabling technology mainly for cost reduction. 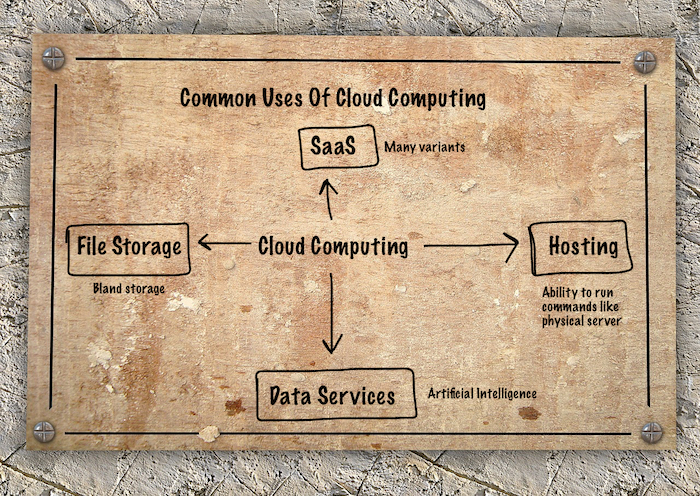 We have too many articles around basic things related to cloud computing. Many yet do not understand basic matters around cloud computing. Here is an article on most common uses of cloud computing with examples. Since 2016 many age-old practices around cloud computing has been changed. Who are not used with matters around cloud computing, we would like to suggest them to read our older articles like cloud computing service models for getting a better practical idea. At present, as business data is critical and demands control, workloads and services; it is not currently recommended to deliberately migrate to public cloud. The reason to use cloud computing services at present are either for huge cost savings or specialised services. With decline of pricing of dedicated servers, not even a larger website needs sole cloud servers. But having a live copy on cloud server can save from outages. 7 years ago we talked much about hybrid cloud. Basic form of hybrid cloud is having a dedicated server and using various global standard cloud services for practical needs at affordable costs. Infrastructure as a service (IaaS) and Platform as a Service (PaaS) are one of most common usage of cloud computing service which is cheaper, does the job and very much flexible for testing and development and avoids complexity and delay of deploying a physical server. Infrastructure as a service (IaaS) commonly referred to the end consumer by the hosting companies as Cloud Server. A new thing is Serverless Computing and Function-as-a-Service (FaaS). Various File Storage services includes free and paid cloud storage service, backup services, file sharing services, CDN services to small personal webpage hosting. This usage is possibly most used all over the earth. A example, we have a 2017’s list of free cloud storage services. This is a separate segment of cloud computing as the data is in different format, the segment demands manual work like merging log files and services often includes usage of Artificial Intelligence and Machine learning. In a previously published article we explained why integration of cloud based big data analytic services are many a times practical. Rest of the cloud computing services mostly Software as a Service (SaaS) and ranges from online document editor, image manipulation tools to DNS services. This Article Has Been Shared 2976 Times! Cloud Computing Guide For Cloud Storage is continuation of the previous articles and guides about on storage, which is a model of online storage of data. Cloud Document Management System are computer programs, used to track, store documents and usually capable of keeping track of revision. Microsoft’s New Strategy of Open Source Cloud Computing is Possibly Known now with Azure Strategy. They are loving unixoids to stay on this market. Cite this article as: Abhishek Ghosh, "Most Common Uses Of Cloud Computing : Examples," in The Customize Windows, June 27, 2017, April 21, 2019, https://thecustomizewindows.com/2017/06/most-common-uses-of-cloud-computing-examples/.